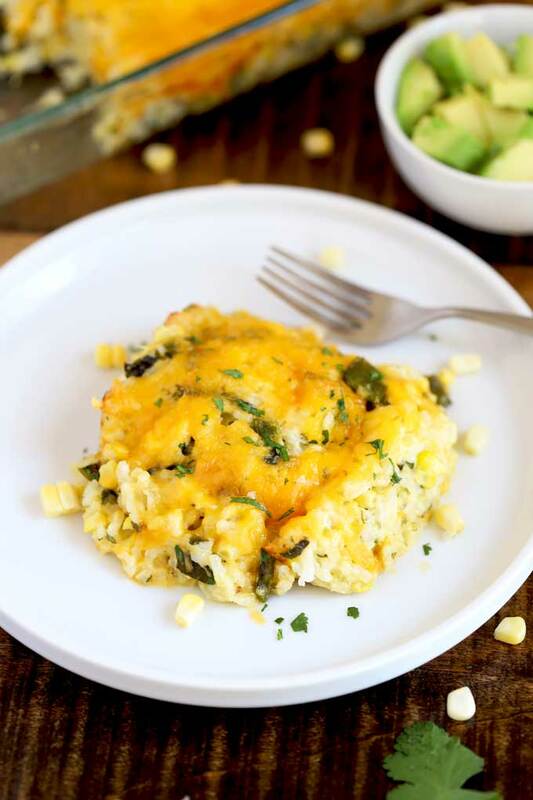 This Rice Casserole is filled with corn, roasted green chiles, sour cream, cilantro, and cheese then baked until perfectly golden! 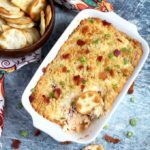 Creamy, cheesy and easy to make, this Mexican Casserole is always a family favorite! 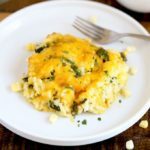 This rice casserole is one of the most satisfying Mexican side dishes. 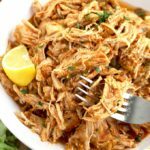 We love serving it alongside Tequila Lime Chicken, our favorite Slow Cooker Carnitas and also alongside Pan Seared Steak! The possibilities are endless! 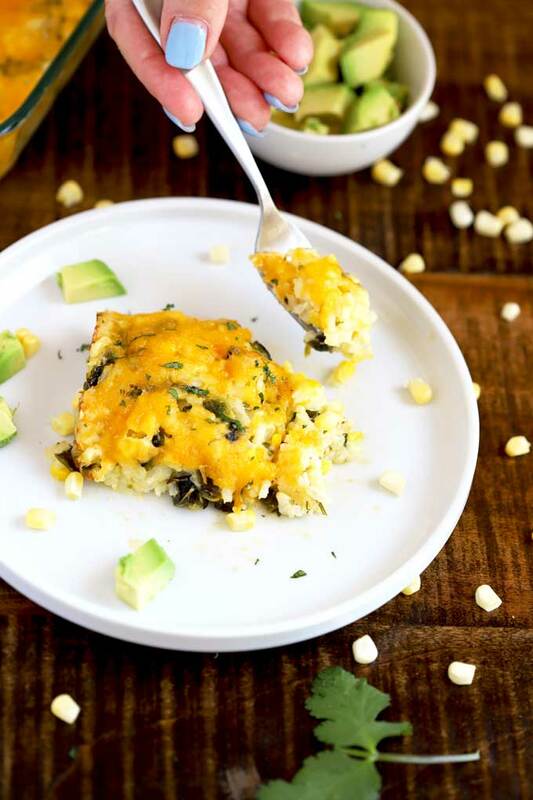 This tasty and creamy vegetarian casserole is inspired by one of the most popular side dishes at Zarela’s Restaurant in New York, this Creamy Rice Casserole was definitely a crowd pleasing favorite! Zarela Martinez is a wonderful restaurateur and cookbook author. She is not only a brilliant chef but also a warm and joyful woman who immigrated from Mexico and created magic in the kitchen. Talk about a success story! 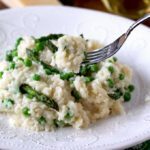 This rice recipe doesn’t have any fancy ingredients which makes it convenient and also budget friendly. Rice, I use long grain white rice. Corn kernels, I use fresh or frozen corn. Canned corn can also be used. 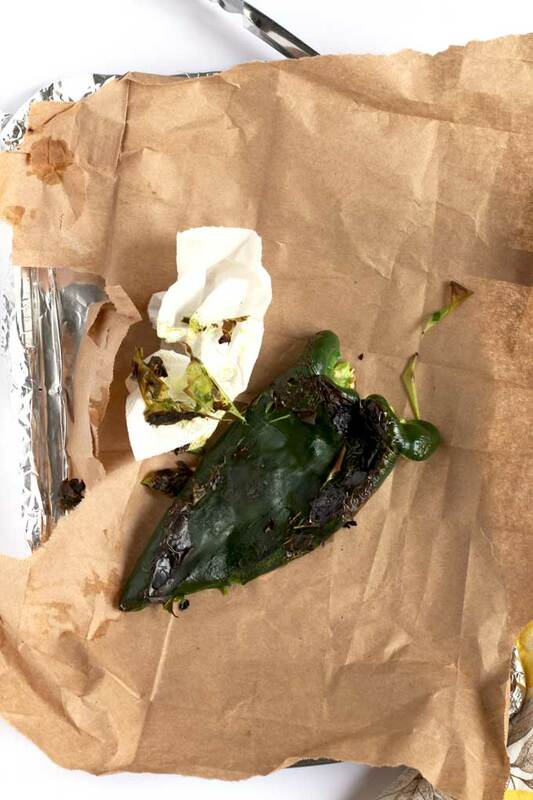 Roasted Poblano Peppers, I roast/char mine at home. 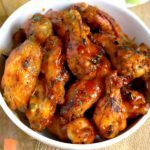 Canned roasted chili peppers can also be used. Sharp Cheddar Cheese, Monterrey Jack or a Mexican blend can be used. Olive oil, salt and water. 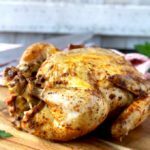 There are different ways to roast or char chili peppers. 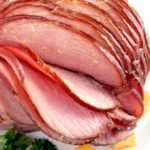 All methods are very quick and easy although oven roasting may take a bit longer than other methods. I explain each method below. Note: If your peppers have a stem, you can cut it off before or after the roasting is done. Roasting Peppers On The Gas Stove in an Open Flame: This is by far my favorite method if I only have one or two peppers to roast. It is by far the quickest way to char a pepper and also produces the smokiest richest flavor. Of course, when using this method the right terminology is “charring” not “roasting”. Turn the stove burner to medium. 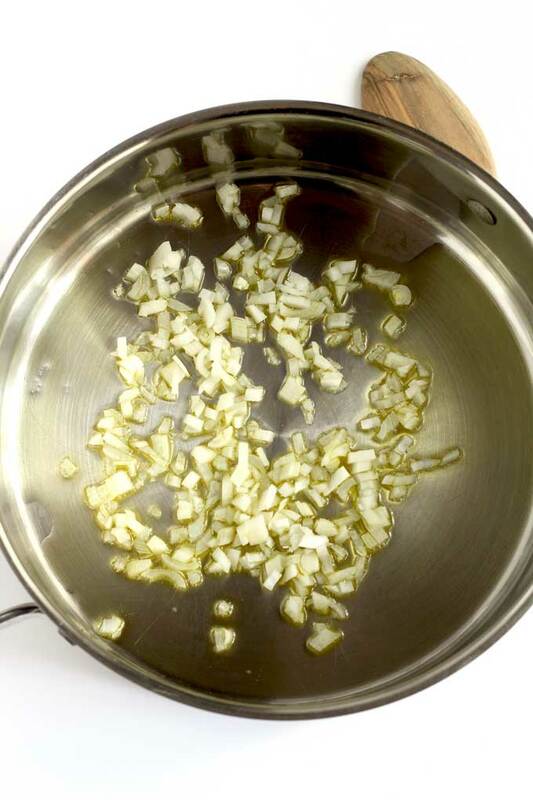 With kitchen tongs, carefully place the pepper on the grate directly over the top of the gas flame. Use kitchen tongs to turn the pepper until all sides are blackened. Remove from the burner and proceed to “peeling and stemming” below. 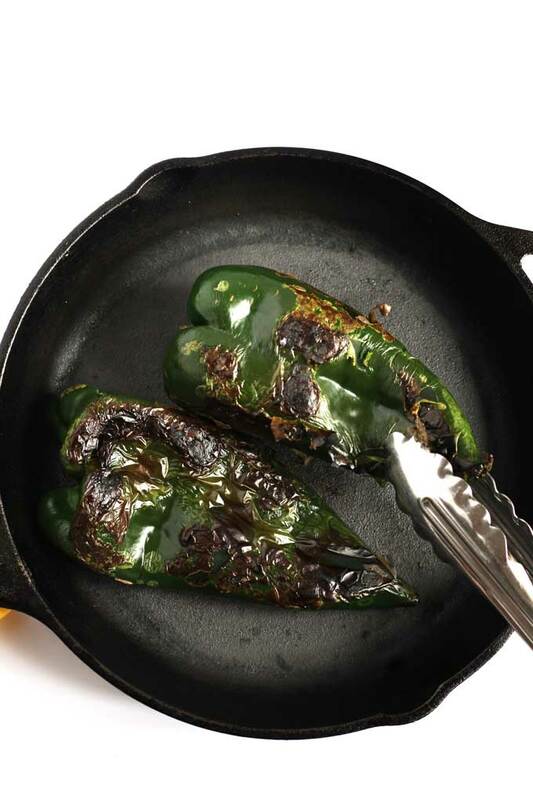 Roasting Peppers in a Cast Iron Skillet: This method works wonderfully if you don’t have a gas stove and want to roast your peppers quickly. You can also roast as many peppers as your skillet will fit. Heat a cast iron skillet over high heat. 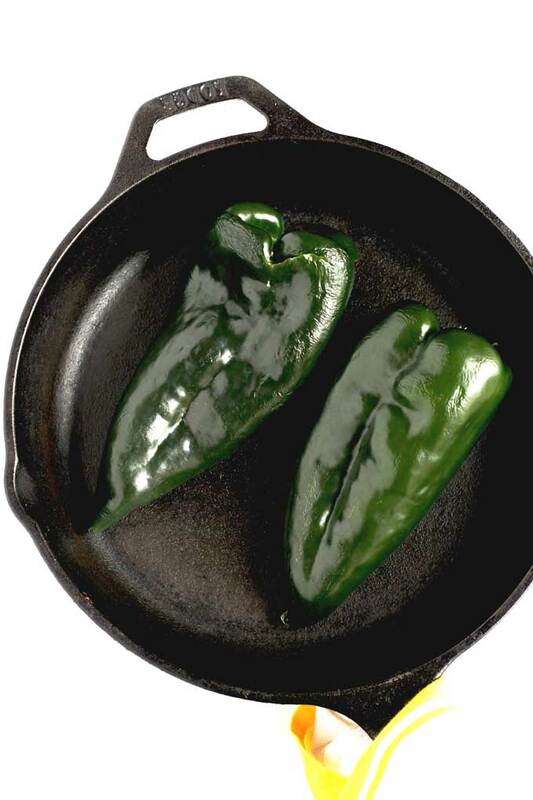 Place the chili pepper in the skillet. Remove from the stove and proceed to “peeling and seeding” below. 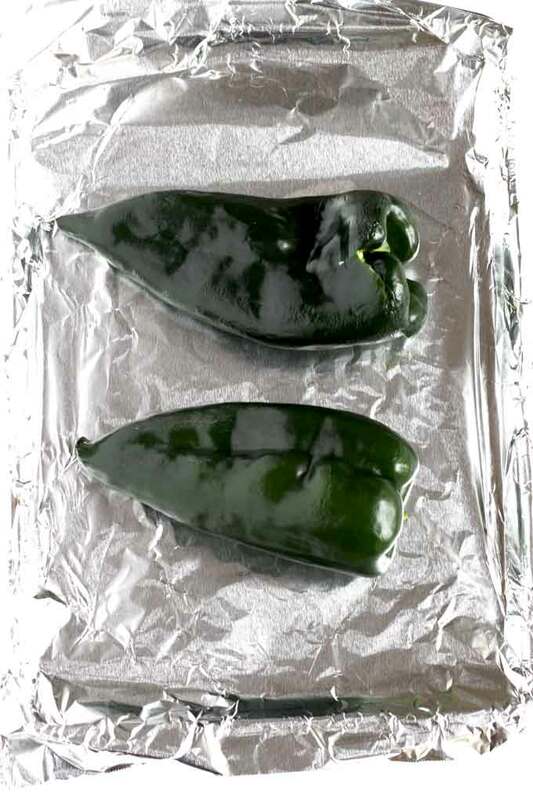 Roasting Peppers In The Oven: This method is great when you have multiple peppers to roast. It also produces the tastiest, almost sweet and caramelized peppers. Brush a baking sheet lightly with oil. Place the peppers on the sheet pan and roast for about 20 minutes. Using kitchen tongs, turn the peppers and roast for another 15 to 20 minutes (time will vary depending on the size of the peppers). The peppers will look soft and will most likely collapse. Remove from the oven and proceed to “peeling and seeding” below. Roasting Peppers In The Oven – Broiling: This method requires a watchful eye as broilers tend to blacken things quite quickly. Place the peppers on a baking sheet pan. Let them char turning them about every 5 minutes. The peppers will look quite blackened and almost crispy. Peeling and Seeding: After your peppers are roasted/charred, continue as follows. The easiest way to peel a roasted pepper is by steaming it. There are several ways to do this. 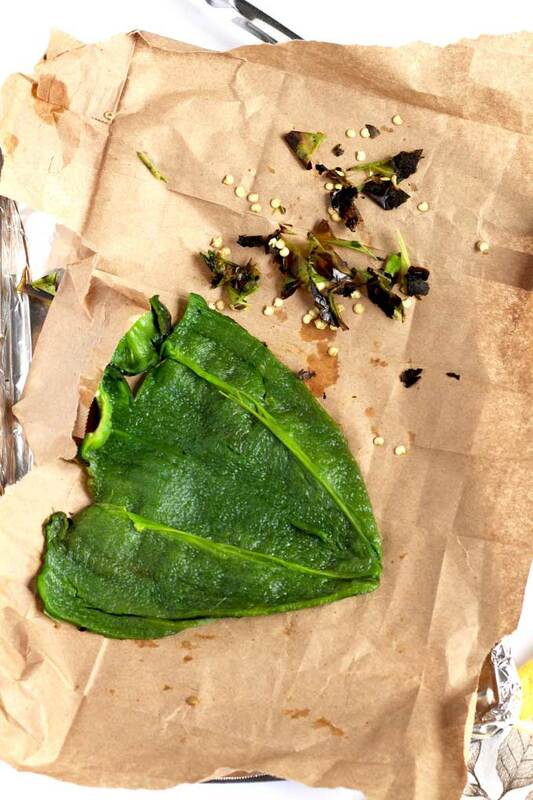 Place the roasted pepper in a paper bag and seal it or use a zip top bag and close it to keep the steam inside. This method works great when you have one or two peppers. For multiple peppers, place the roasted pepper in a bowl and cover the bowl with plastic wrap. Let the peppers steam for about 10 to 15 minutes.. Remove the roasted peppers from the bag or bowl and with the help of a piece of paper towel, rub off the skin. It will come off quite easily. 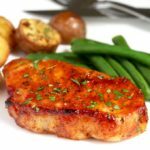 You can leave some of the blackened skin on for extra smoky flavor. Slice the pepper from top to bottom and open it up. With a piece of paper towel, wipe off the seeds. Now you are ready to slice, cut or chop your peppers! Add the chopped onions and saute for about 3 minutes or until they become translucent. Add the garlic and saute for about a minute. Add the rice and saute stirring frequently for about 3 minutes or until the rice gets opaque but not toasted. Add the corn, water and salt and bring to a boil. Cover the pot and lower the heat to low. Cook for 15 minutes. 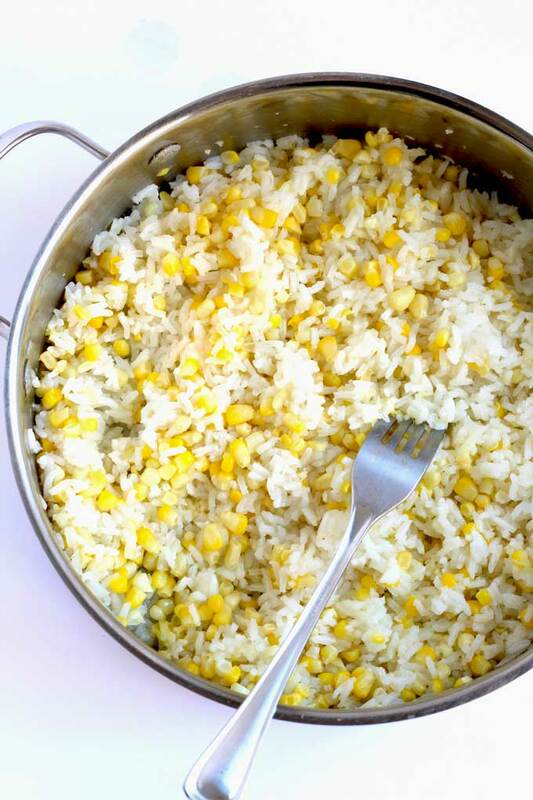 Uncover the pot and fluff the rice with a fork. The rice should be tender, however if it is still “al dente”, cover the pot and cook for another 5 minutes. Remove the rice from the stove and transfer it to a bowl. Let the rice cool for a few minutes. 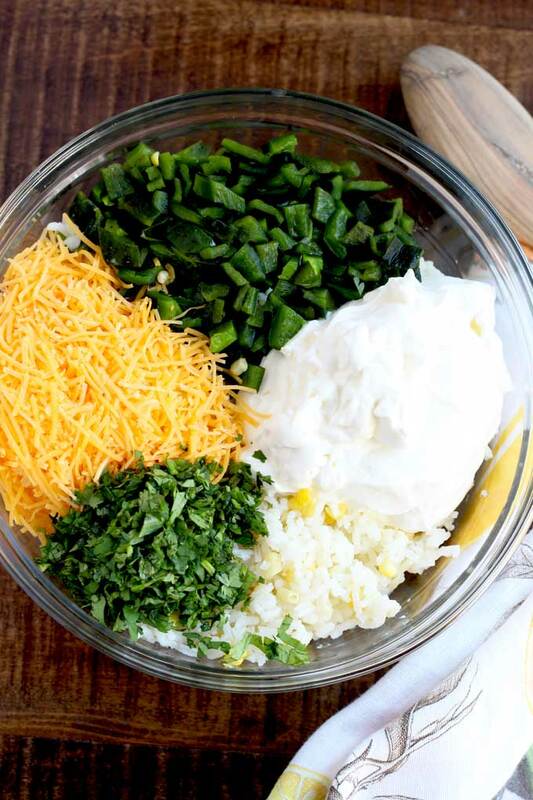 Mix the rice with the sour cream, roasted chili peppers, shredded cheese and cilantro. 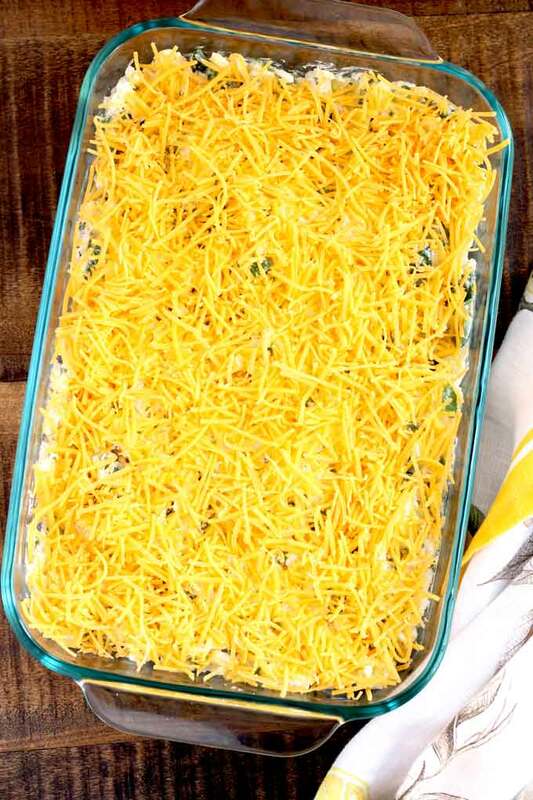 Place the rice mixture in a baking dish and top with extra shredded cheese. 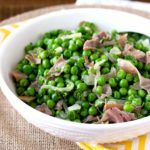 Although I used Poblano peppers, you can use Hatch Chile Peppers or Jalapenos – just beware of the heat factor of the pepper you choose. You will need about 1/2 cup of chopped roasted peppers. If using canned peppers, a small 4 ounce can will do. Drain them first! Experiment with different cheeses like white Cheddar, Monterey Jack, Mozzarella and even Gouda! This delicious Mexican casserole can be made ahead and baked just before serving. It also reheats well! 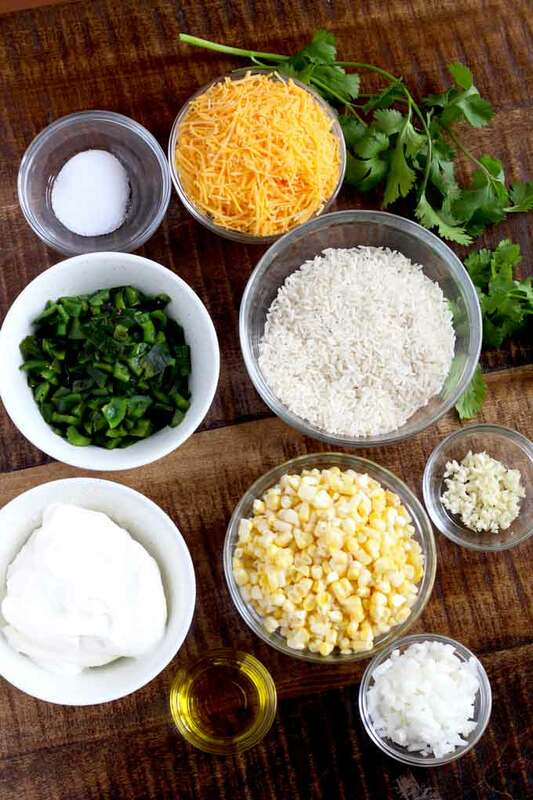 Check out these other Mexican – Tex Mex inspired side dishes! 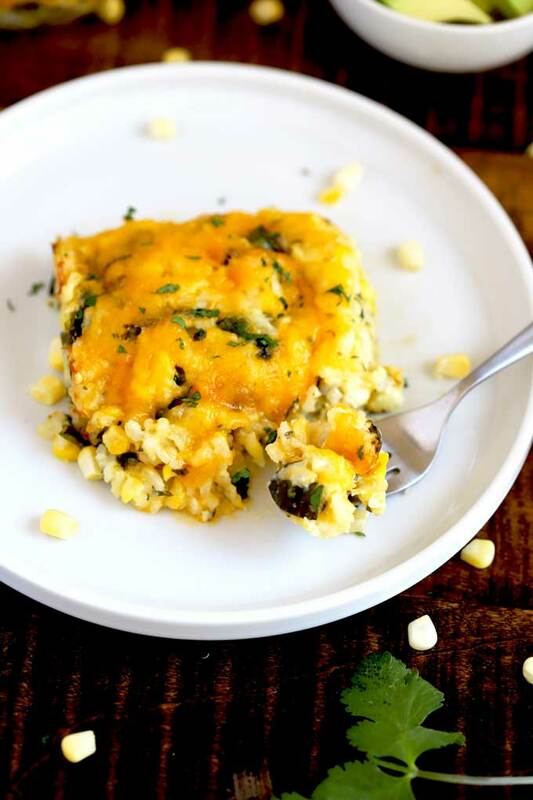 WANT TO TRY THIS MEXICAN GREEN CHILE RICE CASSEROLE? 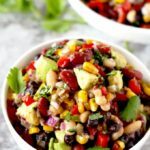 PIN IT TO YOUR SIDE DISHES OR MEXICAN FOOD BOARD!! Heat the oil in a medium skillet over medium-high heat. Add the onions and saute until soft and translucent, about 2-3 minutes. 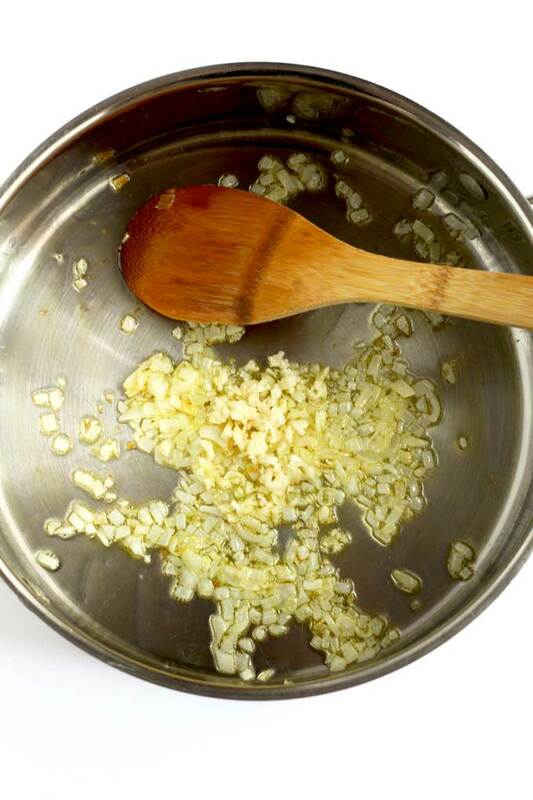 Add the garlic and sauté for about 1 minute, stirring frequently. Add the rice and cook for about 5 minutes, stirring frequently. You want the rice to turn opaque without toasting. 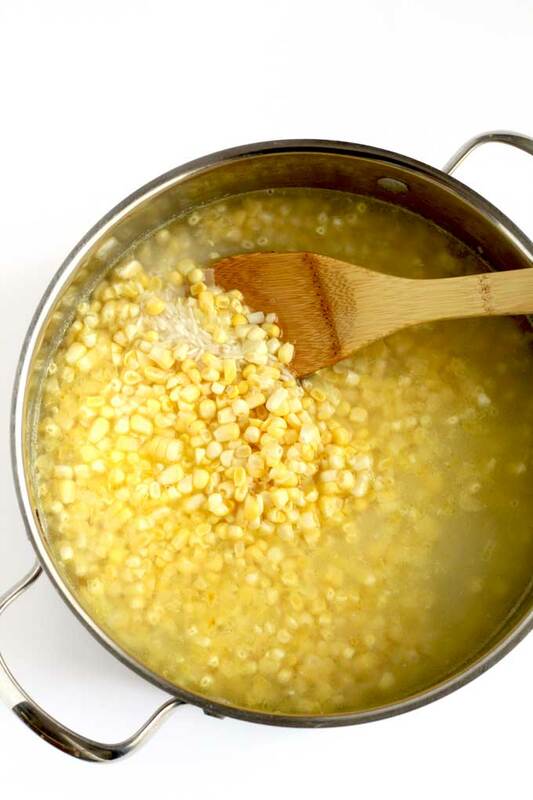 Stir in the water, corn kernels and salt. Bring the mixture to a boil. Reduce the heat to low, cover and simmer for 15 minutes or until the rice is tender. 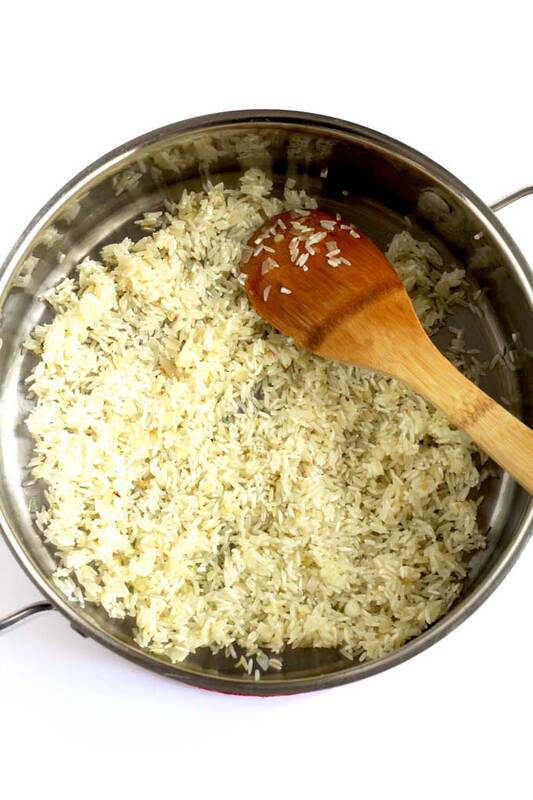 When the rice is cooked, fluff it with a fork and transfer it to a bowl to cool for a few minutes. 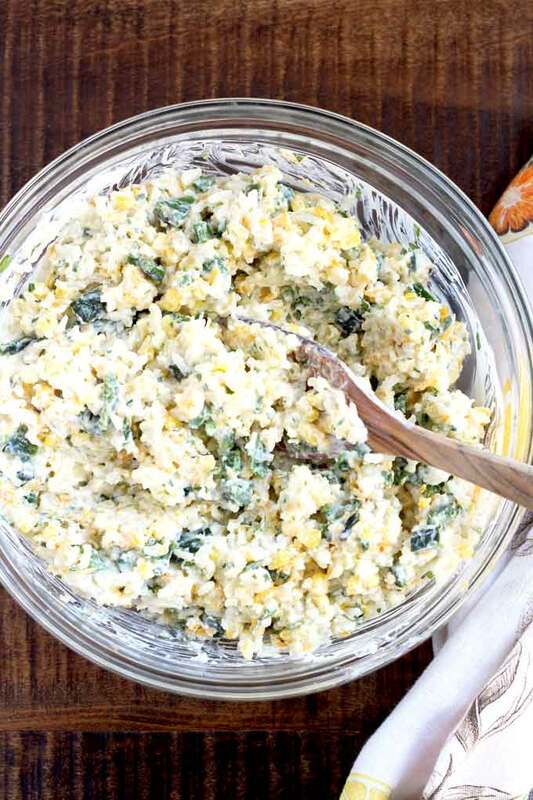 Mix the rice with the roasted poblano chiles, cilantro, sour cream and cheese until well combined. 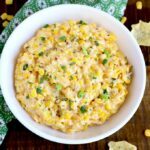 You can use fresh, frozen or canned corn. My family loves salt so we use 1 teaspoon of salt. However, if you are using a saltier cheese that may be a bit much. To char/roast the peppers: (detailed instructions for different methods in the post). Put them over an open flame until they blackened on all sides or place them under the broiler turning them as needed. 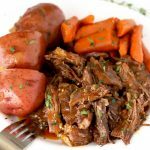 They can also be roasted on a dry hot cast iron skillet or in the oven at 400 degrees (in the oven they will take longer). 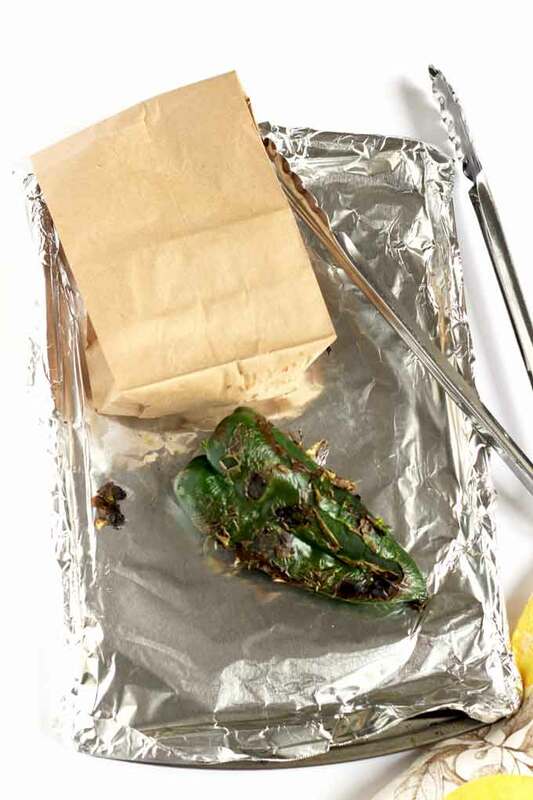 Place the charred/roasted peppers in a zip top bag, paper bag or wrap them in foil. You want them to sweat/steam for about 10 - 15 minutes. This will make the skin peel off easily. Just rub them with a paper towel and the skin comes off. Remove the stem and seeds. Zarela's son is Chef Aaron Sanchez!!!! 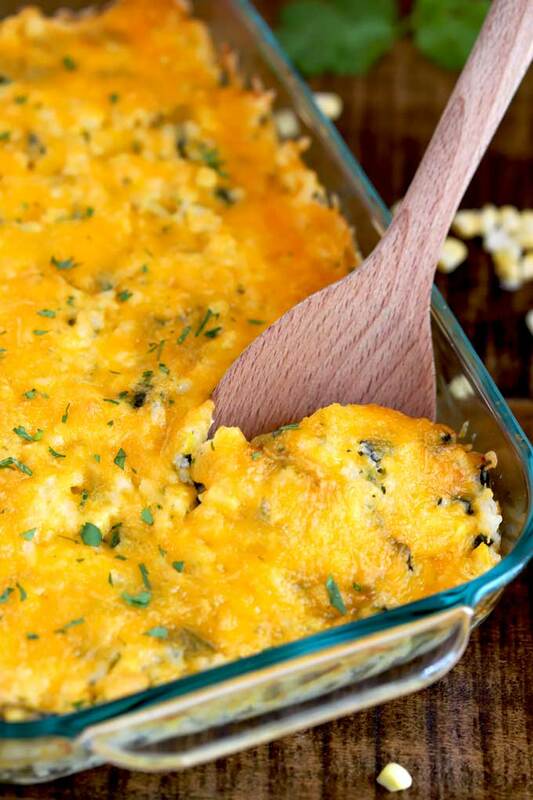 This Mexican Chile Rice casserole looks like a delicious crowd pleaser! What a great addition to a fajita or taco night! 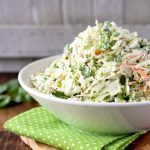 I made this last night– it was amazing… it will be making a regular appearance at my house! This turned out very creamy and so good. I used hatch chiles because I had them handy. Next time I will try it with poblano.